We are an RRCA chapter of local runners and walkers who enjoy social and training runs in our beautiful area. All are welcome! TRC 2014 Membership now open! 2014 membership is now open! Membership runs the calendar year - January to December. The membership dues go towards paying our annual membership into the RRCA (Road Runners Club of America). This membership is very important to us - it allows us to have the insurance needed to put on the great events we have been doing for two years. These events give back to the community. Thousands of dollars and hundreds of pounds of food have been given locally over the past two years. For a small fee of $12 for individual and $20 for family you can help keep our good will going and help us with our mission of "Giving back one step at a time". Please see our "Join TRC" page for more details and the membership form. 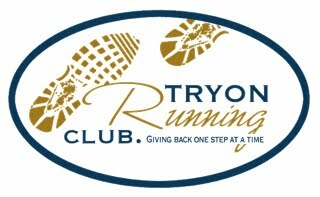 Tryon Running Club members get a $10 discount on the Tryon Half Marathon!!!! Please support our gracious sponsors for the 2014 Tryon Half Marathon! Please consult with your physician before beginning or changing any exercise program or taking advice regarding your diet or exercise needs. Please keep in mind that the authors of this blog are neither health professionals nor registered dieticians. Any advice given is solely based on personal experience and research.